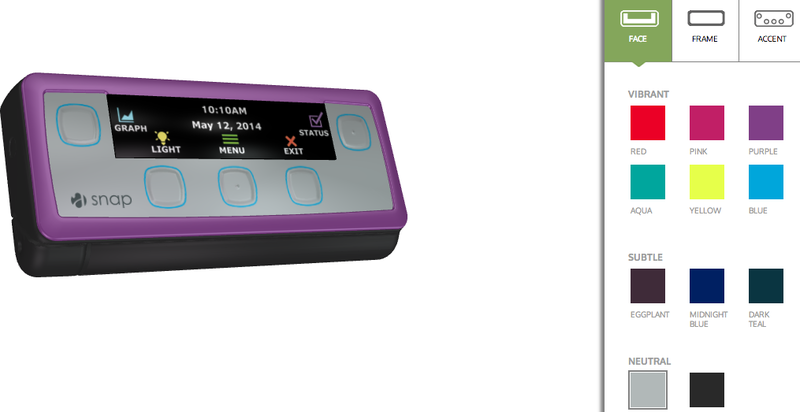 As you may know, I have been using the Asante Snap Insulin Pump since my 30-day free trial in November of 2013. I thought they were cocky that I'd love it in 30 days, but I did, so it's been my pump of choice since Christmas Day 2013 when I unboxed my new red Snap (1.0). Their latest product is called the MySnap and it's a user-designed color-customizable pump. Using the MySnap designer, the user can choose from 11 different face and frame colors, as well as accents like patterns and colored button outlines. No two MySnaps have to look alike. I chose a blue face with a blue frame. Shocking, I know. They've made some respectable updates to their original product and I will outline them below. They have also added IOB to the home screen, as Insulet Omnipod did with their latest update. This is crucial information that helps us make management decisions and I appreciate quicker access to it. The left button (from a sleeping screen) can now function as a shortcut to Temp Basal. Very useful and I've used it already in my first week. I still have my right button set as a shortcut to the Bolus Calculator. A cannula prime now resets the Pump Alert (site reminder). That's a nice touch. What's missing from MySnap? I'm not thrilled with the lycra case they sent. My husband likes it, but once again, I feel it's man-designed. I've already scratched my screen using it because I'm a bit of a klutz, so I've gone back to my Tallygear G4 standby case. And it works beautifully. They also took away the option for Daily Alerts. I had been using these as a stand-in for missed meal bolus reminders after my usual breakfast, lunch, and dinner timeframes. I'm quite pleased with the product after using it for a week and will shush now let you watch me try to unbox it with a 2yo and 4yo. Try Snap for 30-days by clicking here in the month of December and my beloved Diabetes Hands Foundation gets a donation! 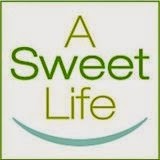 Disclosure: Asante Solutions provided me with a complimentary upgrade to their new MySnap insulin pump controller. They do not provide me with supplies or other compensation. My views are my own. My review of their product is unsolicited. This blog is not sponsored by any entity or corporation. I am not paid to review diabetes devices - I'm just obsessed with telling people what I think about ALL THE THINGS. I don't think I've ever watched a video of Snap features before (though I'm sure you've probably done one) so I learned a lot. That pump is pretty cool. But for me, the best part of the video was your kids. Love them! !